NASCAR driver, Carl Edwards, Jr., was born on August 15, 1979 in Columbia, Missouri. 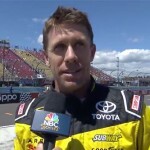 Carl Edwards is currently a NASCAR Sprint Cup Series and Nationwide Series driver for Roush Fenway Racing. In the Sprint Cup Series, Edwards drives the #99 Ford Fusion which is primarily sponsored by Aflac. His #60 Nationwide Series car, also a Ford Fusion, is sponsored by Scotts-Miracle Gro (and their brands, Scotts, Miracle-Gro, Ortho and Roundup), Dish Network, Citigroup, vitaminwater, Save-A-Lot Food Stores, and the World Financial Group. Edwards was inspiered watching his father, Carl, Sr., race, and was inspired to do the same. Carl, Sr. has been racing modified stock cars and USAC midget sprint cars for over four decades, winning over 200 races. Carl, Jr.'s career began in 1993, when he raced Minicup cars all over the Midwest. His success was not far off, in 1994, he won four feature races in the MMRA National Future stars Minicup series. He added a combined total of 14 wins from the 1995 and 1996 seasons. 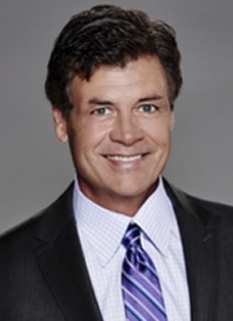 Carl attended the University of Missouri, and was a substitute teacher when he began racing in NASCAR. Edwards' big break came in 2001, when he competed in 7 NASCAR Craftsman Truck Series events for MB Motorsports. His best finish in the seven races was 8th at Kansas Speedway. He also ran one Busch Series race for Bost Motorsports, finishing 38th at Gateway International Raceway. However, it was enough to impress Jack Roush, and Edwards became a full-time Truck Series competitor in 2003, driving the #99 Ford F-150 sponsored by Superchips. He won Rookie-of-the-Year honors in addition, to three race wins, eventually finishing 8th in the points standings at the end of the season. In 2004, he notched three more race wins, including the season-opening Florida Dodge Dealers 250 at the Daytona International Speedway. At season's end, Edwards finished 4th in the points. In August 2004, he made his NEXTEL Cup Series debut, replacing Jeff Burton, who left the team, in the No. 99 Ford Taurus for Roush Racing, at the Michigan International Speedway. He finished 10th. He drove the #99 Ford for the remainder of the 2004 NEXTEL Cup. He also once again ran one Busch Series race; this time for Robby Benton Racing at Bristol Motor Speedway with sponsorship from Mac Tools. In 2005, Carl Edwards became a full-time driver in both the NEXTEL Cup and Busch Series. He has already won races in each, and he made history in the process of winning. On March 19, 2005, Edwards won the Aaron's 312 at the Atlanta Motor Speedway in Hampton, Georgia, recording his first Busch Series win. The next day, he beat Jimmie Johnson by 2-hundredths of a second to win the Golden Corral 500 at the same track for his first NEXTEL Cup Series win. Until this took place, no driver had ever won both the Busch and NEXTEL Cup Series races in the same weekend at Atlanta, although the feat had been pulled off numerous times before at other tracks by other drivers. Also, Edwards became the first driver in NASCAR history to pick up his first career Busch and NEXTEL Cup Series wins in the same weekend. On June 12, 2005, Edwards picked up his second NEXTEL Cup win by taking the checkered flag at the Pocono 500 at the Pocono Raceway in Long Pond, Pennsylvania. The weekend was somewhat bittersweet for Edwards, as the Busch Series race at the Nashville Superspeedway in Lebanon, Tennessee had been rained out the night before, and rescheduled for the same day. Even worse, qualifying for that race had been rained out, too, and in NASCAR, when qualifying is rained out, the starting grid is set by owner points. Through this process, Edwards was awarded pole, but Hank Parker Jr. ended up driving the car to a 20th place finish. Edwards got his third win of 2005 on October 30 in the Bass Pro Shops MBNA 500 at Atlanta Motor Speedway. On May 18, 2007, Carl Edwards won the pole for the 2007 NEXTEL Open, and while he lead almost the entire 40 lap race, he faded to third in the last few laps, just missing the feature event. On June 17, 2007 Carl Edwards broke his 52 race winless streak in the Nextel Cup by winning the Citizens Bank 400. Shortly thereafter, on July 23, he dislocated his thumb in an eleven car pileup at a late model race at Nebraska Raceway Park (formerly I-80 Speedway) near Lincoln, Nebraska. Carl won his second race of the 2007 season, and sixth career Cup race, at the Sharpie 500 at Bristol Motor Speedway on August 25. During the post-race interview on Victory Lane, Edwards commented on the race, saying, "This is the biggest win of my career". At the conclusion of the first 26 races, the 2007 "regular season", Edwards ranked 6th in overall standings, with 3372 points, 477 points behind overall points leader Jeff Gordon. Edwards entered the 2007 Chase for the Nextel Cup in 4th place, with 5020 points, based on his two wins in the 2007 season, clinching a spot in the Chase after his win at the Sharpie 500 at Bristol. Edwards struggled through the Chase despite winning at Dover during the Chase. The Hendrick duo of Jimmie Johnson and Jeff Gordon dominated the Chase for the Championship winning 6 of the 10 races and finishing #1 and #2 in the final 2007 standings. Edwards finished 9th in the final 2007 standings. Edwards won the 2008 Auto Club 500 his 1st Sprint Cup win of the year. 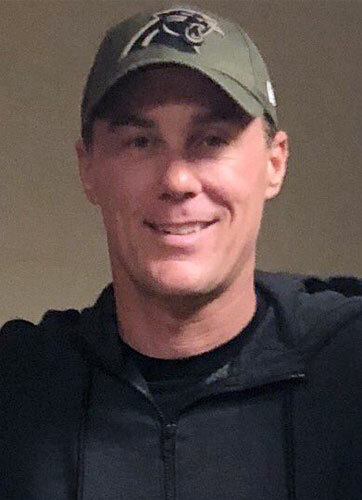 The following week, Edwards won the UAW-Dodge 400 at Las Vegas Motor Speedway, his first back to back victories since 2005 when he won back to back in Atlanta and Texas. These victories would put Edwards at the top of the point standings for the first time in his career. However, following the Las Vegas win, on March 5, 2008, NASCAR penalized Edwards, owner Jack Roush, and crew chief Bob Osbourne for violations found in post-race inspection. The No. 99 car driven by Carl Edwards was found to be in violation of Sections 12-4-A, 12-4-Q, and 20-2.1J of the 2008 NASCAR rulebook, specifically the cover was off the oil tank. The violations were found during post-race inspection at Las Vegas Motor Speedway on March 2. The following penalties were levied by NASCAR: Edwards was fined 100 driver points and stripped his 10 bonus points for the Las Vegas win which would be used to seat him in the Chase for Championship (should he make The Chase). Roush was fined 100 owner points and Osborne was suspended for six races and fined $100,000. RFR may contest the penalty, but only for the basis of drivers and owners points lost, as Osborne will begin serving his suspension. However, others in the garage, such as Ryan Newman, Elliot Sadler, and Lee White of Toyota have criticized the Roush Fenway team, saying that it was intentional. A similar penalty involving the #0 JD Motorsports team, who also had their oil tank top removed, was contested by the team but was not lifted.Edwards was leading the Kobalt Tools 500 looking for his 3rd consecutive victory, but on lap 274 his car began to smoke and his crew diagnosed the problem as a broken transmission. Edwards went on to finish 42nd. On April 7, he won the Samsung 500 at Texas Motor Speedway for his third win of the season. 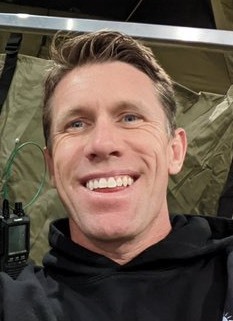 On October 19, 2008 it was reported that Carl Edwards and his girlfriend Dr. Katherine Downey (or Kate Downey) are engaged to be married]. DISCLAIMER: PFP Sports Talent Agency does not claim to represent itself as the exclusive agent for Carl Edwards. PFP Sports Talent Agency is a booking agency that represents organizations seeking to hire pro athletes and sports personalities such as Carl Edwards for speaking engagements, personal appearances, product endorsements and corporate entertainment. Fees on this website are estimates and are intended only as a guideline. Exact fees are determined by a number of factors, including the location of event, the talent’s schedule, requested duties and supply and demand. PFP Sports Talent Agency makes no guarantees to the accuracy of information found on this website and does not warrant that any information or representations contained on this website will be accurate or free from errors. We are often asked how can I find out who is Carl Edwards's agent? 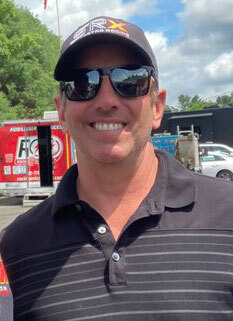 To find Carl Edwards appearance fees and booking agent details, you can contact the agent, representative or manager through PFP Sports Talent Agency for speaking fee costs and availability. PFP Sports Talent Agency can help your company choose the ideal sports personality for your next marketing campaign. To hire Carl Edwards for an appearance, speaking event or endorsement, contact Carl Edwards's booking agent for more information.